1977 was a significant year for technology, with the launch of several different brands of microcomputer, games consoles, laser printers and even smart watches. Some new launches seemed less ground-breaking but were perhaps just as important, and the Digital VAX was one such product. 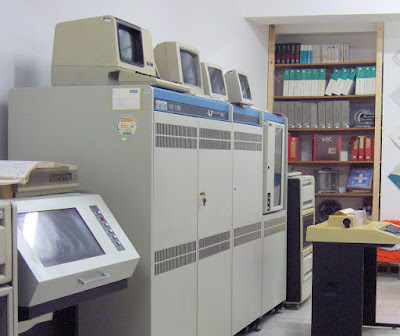 Digital Equipment Corporation (usually shorted to “Digital” or “DEC”) had been a disruptive pioneer in the “small” minicomputer market from the 1950s onwards, best known for their PDP range including the popular 16-bit PDP-11 which was instrumental in the development of Unix. Time marches on, and by the late 1970s the PDP range was looking tired. So, in October 1977 DEC launched the first of their VAX range, the VAX-11/780. Somewhat backward compatible with the PDP-11, the VAX introduced a 32-bit architecture and virtual memory addressing. The VAX was designed to be easy to program, and along with it was launched the new VAX-11/VMS operating system which was thoroughly up-to-date in a 1970s sort of way. DEC also had its own version of Unix called ULTRIX and eventually BSD Unix became available too. This made the VAX-11 range the computer of choice for many corporations and universities. The “minicomputer” name given to this type of machine is unfamiliar today, and given the huge bulk of the VAX-11/780 it seems ridiculous. 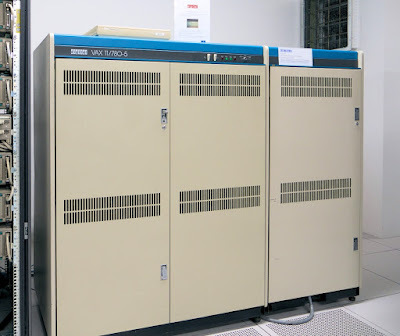 However, the VAX was “mini” compared to the vast mainframes that IBM offered, and all you would need for an 11/780 was a suitably air-conditioned room with a three-phase power supply rather than a dedicated building. Later VAX-11 models could run off a standard plug. Having that much power and flexibility in a relatively compact computer added to the appeal. Crucially, these were multi-user computer systems. Dozens or even hundreds of people could connect to a single VAX, and those VAXes could be networked together. Files could be shared securely and applications could be run, typically using a dumb terminal such as a VT52. The preferred operating system for VAXes was VMS, and this too was a significant step forward. An extremely stable OS, VMS became the choice of businesses that didn’t want downtime. Because DEC controlled both the hardware and software, it made it much easier to make sure everything worked together. Potentially you could run a VAX/VMS system for years without downtime unless you wanted to upgrade the OS or run a standalone backup. VMS became a significant inspiration for Microsoft’s Windows NT platform, used by every modern version of Windows. This is no coincidence, as Dave Cutler was a technical lead on both OSes (later moving to help develop Microsoft’s Azure platform). In the smaller systems market, NT is the only effective opposition to Unix-derived systems such as Linux, Android and iOS. The VAX line was very popular, and over the years the range expanded to include small MicroVAX systems all the way up to supercomputers. Hugely popular at first, the VAX suffered as the minicomputer market decline in the face of business PCs, which eventually led to DEC being taken over by Compaq, who in run were taken over by HP. Although the last VAX computer was built in 2005, the operating system (now called OpenVMS) was ported to DEC’s Alpha platform, then Intel Itanium with a port to x86 in the works. HP still promote OpenVMS for running mission critical applications. The VAX-11/780 is hardly a collectable item today due to its sheer size, and most second-hand bits of VAX hardware are probably bought by people keeping ancient installations running. But you don’t have to look far to see the influence of VMS – the architecture of any modern Windows PC is certainly a nod in that direction.